What is the volume of China's direct imports to Malaysia via e-commerce? With 1.8M+ items flowing directly from China into Southeast Asia via Lazada during 12.12.2017, how many of them are coming into Malaysia? What is the share of Chinese direct-imports from our total e-commerce market size? This article is inspired by Pawoot Pongvitayapanu, check out his Thai version here. In order to warm-up to this topic, you are encouraged to read our previous article on does Alibaba's investment in Thailand spell doom for local businesses? What is happening in Thailand, is happening in Malaysia and Southeast Asia countries too. This is probably with the exception of Alibaba is investing in Thailand (USD320M), while ironically, Malaysia (under the previous government) could be the other way round. With such threat to the local businesses, how do we forecast and quantify the number of Chinese items coming into this region and specifically Malaysia? Let's break down some numbers in this article. 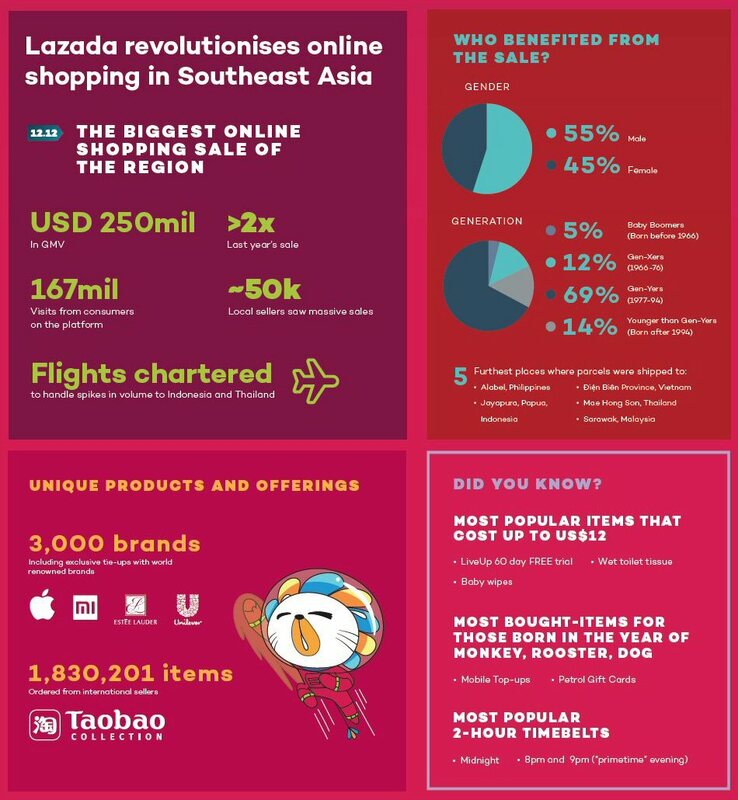 A good point to start with is by referring to the infographic released by Lazada for its 12.12 sale back in 2017. Do take note that the figures above are combined results for all 6 countries Lazada is operating in Southeast Asia. 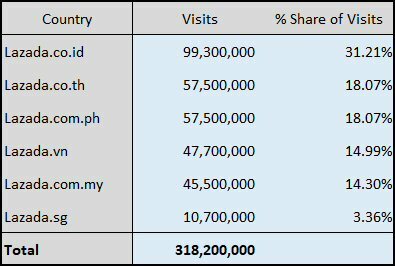 Since Lazada didn't reveal the breakdown by countries, let's start with estimating the % share of web traffic by countries, using SimilarWeb data as a benchmark. Visits above is derived from SimilarWeb for the month of December 2017, and % share of visits is calculated based on the total visits to all 6 Lazada sites. Even though the visits reported above might not be accurate, but it is still a good indicator to benchmark % share of traffic by country. 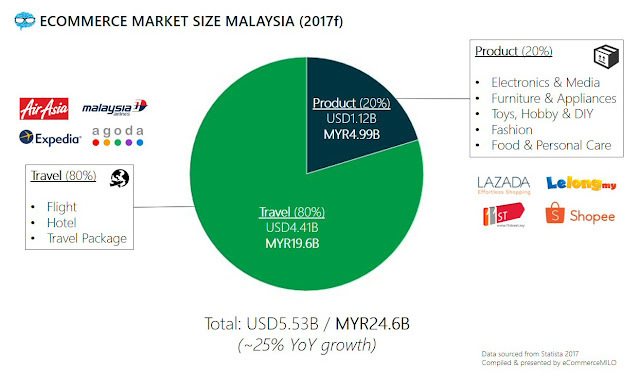 We can also estimate that Indonesia is Lazada's biggest market in Southeast Asia, followed by Thailand, The Philippines, Vietnam, Malaysia, and Singapore. This is proven by the fact that flights were chartered by Lazada to handle spikes in volume to Indonesia and Thailand. However, when we cross-check this finding with a cross-border logistics insider who preferred not to be named, the actual scenario might be quite different from the numbers simulated. "Malaysia and Indonesia are the top two, should be around 35% and 33% each. Thailand is smaller say around 15% because the cross-border cost is higher and there are a lot of restricted items which they can't import now. The rest will be Singapore and Philippines. 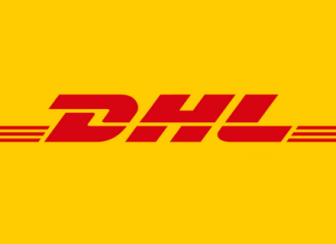 As far as I know, Lazada doesn't have cross-border logistics solutions from China / Hong Kong to Vietnam as sellers might make their own arrangements there," comments by the logistics insider. With RM1.02 billion (USD250 million, currency exchange rate of USD1 = RM4.08 on 12.12.2017) reported for the whole region, GMV of Lazada Malaysia can be estimated to be around RM145 million during 12.12 campaign. If we estimate AOV (Average Order Volume) of RM100, there were 10.2M orders made across the region, and 1.46M orders transacted via Lazada Malaysia. As per reported by Lazada in the infographic above, there were 1,8320,201 items ordered from international sellers, it is not a stretch to presume almost all of them are from China. If we divide 1.8M items from China by 10.2M total orders, close to 18% of orders from Lazada across all 6 countries were shipped directly from China. So, how many of those items are coming into Malaysia? If we use the same % weight above (14.30% for Malaysia), there were around 261,704 items flowing from China to Malaysia (direct-to-consumers) during 12.12.2017. Let's make another assumption, AOV of China imports could be lower than the overall AOV of Lazada. So if the AOV is around RM50, GMV for China imports alone is estimated at RM13M+ via Lazada Malaysia. Most insiders would agree that 12.12 campaign by Lazada is like a whole month's sales being condensed into this 3-days' period, as consumers tend to "save their bullets" for the month and buy during 12.12. Therefore, if we accumulate monthly average GMV of RM13M+, it would be RM156M+ GMV for China imports across 12 months. It is likely that this particular chunk of GMV is free from duty (break parcels, direct-to-consumer) and free from GST. This is an unfair competitive advantage for China exporters against local merchants, at our own home ground! Not to mention the loss of tax income to the country. Now, let's refer to our report earlier on e-commerce penetration in Malaysia for 2017, the products-only market size is estimated to be close to RM5B. If we are to make a small conclusion here, more than 3% of products sold online here were imported directly from China in 2017. Would it be 5% if we are to include direct-imports on platforms beyond Lazada? The pie above can be considered as conservative, as the direct-import volume could be significantly higher if we take the logistics insider's comment above into consideration. This is also without including the made-in-China products imported by local merchants and traders. 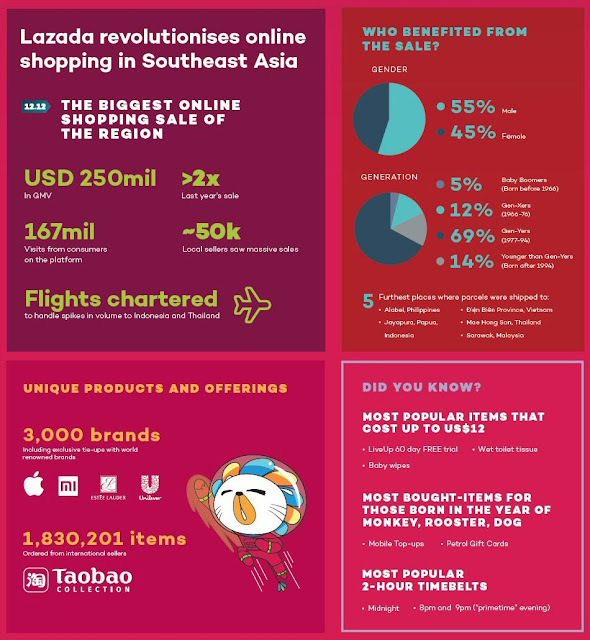 By referring back to the infographic above, Lazada has reported that 12.12.17 performance is 2x of the previous year. You can only imagine the growth rate of China imports in the coming years, even more, when Alibaba and DFTZ's infrastructure is up and running. Local merchants and retailers, it is time to brace yourself for impact! Note: Most figures above are forecast and estimates based on the infographic published by Lazada. This article is inspired by Pawoot Pongvitayapanu, read his Thai version here. ecInsider: What is the volume of China's direct imports to Malaysia via e-commerce?